California’s miles of coastline provide ample recreational activities for locals and visitors alike, and after a summer of enjoying the sandy beaches, boaters and beachgoers can give back to the environment by volunteering for this year’s Sept. 15 Coastal Cleanup Day. Now in its 28th year, the event has grown annually, becoming the state’s largest volunteer event. Last year, more than 82,500 volunteers removed 1.2 million pounds of trash and recyclables from California’s beaches, lakes, and waterways. 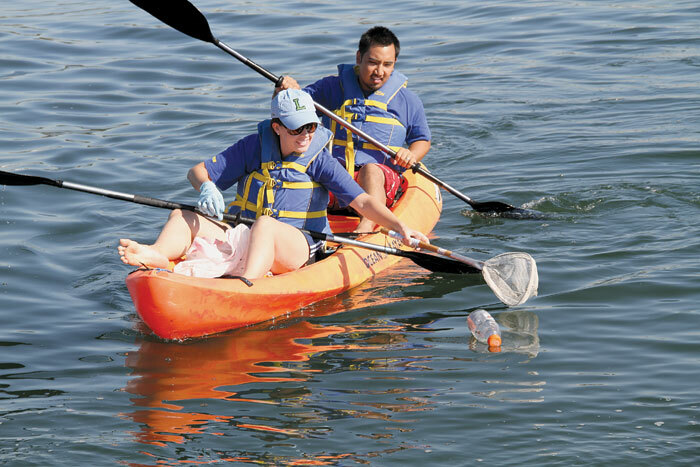 For those looking to participate in an on-the-water cleanup effort, the Santa Monica Bay Restoration Foundation (SMBRF) is hosting an in-water cleanup for Marina del Rey, where volunteers can hop aboard kayaks or paddleboards and clean up debris polluting the waterway. The in-water cleanup is now in its eighth year, and the Santa Monica Bay Restoration Foundation has partnered with Santa Monica Windjammers Yacht Club to set up a home base and registration area for volunteers. The event will start at 8 a.m. and run to noon Sept. 15. For those looking to volunteer for the in-water cleanup, registration is required, as limited kayaks and standup paddleboards are available for volunteers to use. Those with their own watercraft can bring them along and participate, as well. “We have several returning sponsors contributing to our site again, including several food sponsors, an amazing raffle and goody bags for all our participants,” said Michelle Kearney-Staffield of SMBRF. Donations from volunteers are being requested again this year. The suggested donation is $20 per person for those borrowing a kayak or paddleboard and $10 per person for those providing their own. Those interested in participating in this year’s in-water cleanup can register at santamonicabay.org. For more information, call Michelle Kearney-Staffield at (213) 576-6648 or email mkearney@waterboards.ca.gov. Santa Monica Windjammers Yacht Club is located at 13589 Mindanao Way. For those interested in getting below the surface to help clean up, a number of dive sites have been added in Los Angeles County, where volunteer scuba divers can enjoy an underwater adventure and help remove trash at the same time. These sites include: Leo Carrillo State Beach Dive, 35000 W. Pacific Coast Highway, Malibu, contact: diver@blue-gecko.com; Malibu Pier Dive, 23000 Pacific Coast Highway, Malibu, contact: malibudivers.com; Redondo Beach Dive, 150 West Torrance Blvd., Redondo Beach, contact: divnsurf.com; and Santa Monica Pier Dive, 600 Ocean Front Walk, Santa Monica, contact: Eco Dive Center (310) 398-5759. In Dana Point Harbor, divers and kayakers can both hit the water, as a joint cleanup event will be held in the harbor, with volunteers cleaning up the areas between gangways L, M and N on the island. For more information, contact the Dana Point Marina Co. at (949) 496-6137. Dive volunteers must be certified to attend these cleanup sites, and divers are to arrive at 8 a.m. for a 9 a.m. entry. Divers should bring a mesh bag for the underwater cleanup, to gather materials. For landlubbers, hundreds of beach, marina, river and lakeside sites are available to as volunteer cleanup locations, with a complete list of all sites along Santa Barbara, Ventura, Los Angeles, Orange and San Diego counties detailed at the California Coastal Commission’s website. Volunteers can locate a site they wish to sign up for, and then register online. For more information, visit coastal.ca.gov. California’s Coastal Cleanup Day was listed in “Guinness World Records” as the largest garbage collection in 1993. Since the program started in 1985, more than 1 million Californians have removed more than 15 million pounds of debris from the state’s shoreline.